By using the term “A Cooling Off Period” I'm not talking about labor negotiations or other tension, I'm referring to that period when Fall temperatures take hold of tailgaters. It's a time when you burn-up and you almost freeze all in one day. This morning the temperature was in the 40s. By afternoon it will be in the 70s. That's a 30 plus degree swing which can make a tailgater very uncomfortable at either end of the thermometer. If one wishes to tailgate before a game that starts at Noon, they are sure to feel the cold morning air. By the same sense, by afternoon, if their seats are in the sun, they can start to sweat and actually get burned. 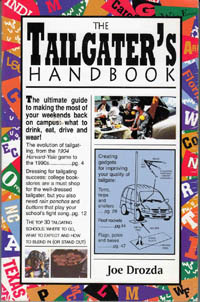 When the game is at night, the pregame tailgating is in the heat of the day where the fans wear short sleeves and look for shade. After sundown, during the game, it can get downright cold. So what's a fan supposed to do? In the Fall it is best to think of things you can do to lessen the effects of nature. If it's a cold morning, try to get out of the wind and into the sun. To get out of the wind, park your vehicle so you tailgate on its leeward side. Set up a windbreak with a tarp (Spinnaker) as well. You can also have some heat source like your grill or even a portable wood burning fireplace. Clothing is the next item that can assure your comfort. Your mother always said that you should wear layers and she was right. By layering a tailgater can put on and take off protection against the cold. A sweater (in school colors of course) is a nice way to stay warm. Natural fibers like cotton, wool and Cashmere are great in that they breathe. Thus they keep you warm, yet don't promote overheating. Also they can be removed when one becomes too warm. They pack nicely in a tote used for seat cushions and a blanket so that later on they can be put on when a chill sets in. Of course stadium blankets are also a part of layering and have been used successfully for more than 100 years. Enjoy your trips back to campus this fall and stay warm or keep cool.